Did you know Hodor is a DJ? Hodor from GoT? Yes, that Hodor. 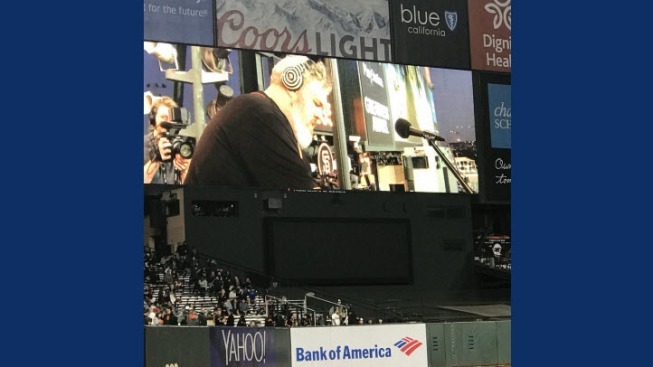 Kristian Nairn, best known for playing the popular character in HBO's Game of Thrones series, surprised fans Monday by serving as a guest DJ at the San Francisco Giants vs. Atlanta Braves game. It was all part of "Game of Thrones" night at AT&T Park. Fans who attended the game were also treated to a limited-edition item of a dragon standing atop the AT&T clocktower. Giants fans were encouraged to dress as their favorite GoT character to celebrate the Emmy and Golden Globe-winning series. Check out the photos and fan reactions below.